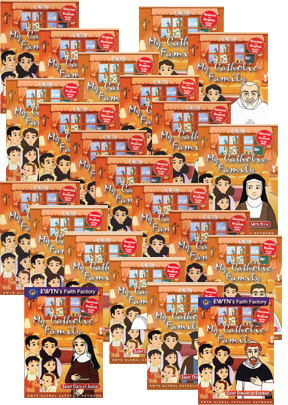 Thomas and Helen help their children Alex and Sara come to a greater understanding of the importance of virtue by teaching them about the lives of the saints. This animated series is entertaining and educational. Episode 16: Saint Thomas More explores the life of St. Thomas More, patron saint of lawyers, and have the chance to put the virtue of service into practice. Episode 17: Saint Rose of Lima explores the first saint from the America, and the brave sacrifices she made spread the message of God's love. Episode 18: Saint Dominic Savio explores this young saint, who dedicated his life to prayer and was just about their age when he died. Episode 19: Saint Joseph explores the importance of trusting god and the value of obedience. Episode 20: Saint Catherine Laboure' explores the life of St. Catherine Laboure' through finding a medal of the Immaculate Conception. Episode 21: Saint Clare of Assisi explores the life of St. Clare of Assisi and her vocation to a life of poverty. Episode 22: Saint Dominic explores the story of St. Dominic de Guzman and the importance of spreading the Gospel.